Post elections and things are status quo on the real estate propositions 5 and 10. I am not surprised with the public not wanting change. While I did believe proposition 5 had some good potential to effect change it was not for the same reasons they were selling it on. It would have likely created more opportunity for many and created more sales annually, it was not going to generate any new housing stock. That is what California needs so desperately. Even more so now with thousands of more homes destroyed by this weekend’s wild fires. 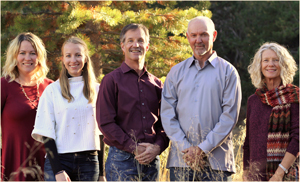 One change that was voted through, and will be worthy of keeping an eye on, is the elimination of vacation rentals in the city of South Lake Tahoe. This measure will eliminate vacation rentals in residential neighborhoods over the next 3 years. Passing by a small margin it is the first of its kind I am aware of. The long-term effects on property values and businesses will be very interesting to watch. Our area of the lake and Truckee don’t have the hotel capacity, so I don’t see how it could happen here, but I never say never. I am sure there will be more information to report as the implementation starts to take effect. Know I will keep you posted. 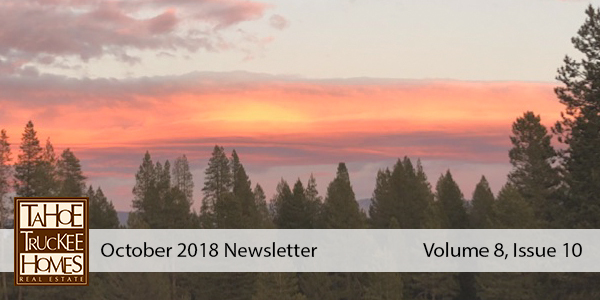 October sales did not disappoint unless you were comparing sales in the Tahoe basin from October 2017 to October 2018. How about exactly half. I too was initially struck by these number of 62 sales last year to 31 this year. That was until I saw that October 2016 had a total of 30 sales so perhaps 2017 numbers are the anomaly. The Squaw / Alpine saw a less significant drop from 17 to 11 or 35% which should not go unnoticed. 2016 had just 9 so 11 is in line with the historical data. Greater Truckee and Tahoe Donner numbers were very similar to last year as well as 2016. Some interesting things happening on the active inventory side of the market. I believe this is the first time in a long time that inventory by area has all been above the previous year’s numbers. Now no need to panic, numbers are up only slightly. Also keep in mind that inventories have been running at historically low levels. 124 homes and 33 condos in Tahoe from Stateline to Emerald Bay and 57 homes and 10 condos in Tahoe Donner represents a very small percentage of the total homes in those areas. I believe we are still in a market where a well-priced home will sell in weeks if not days. Demand is still strong, but buyers are being more cautious, so value is weighing heavy on decisions. My thought remains the same, the market may have peaked and we may be at this peak for some time. Tahoe and Truckee will always be an amazing place to live or visit so real estate demand will remain strong for the foreseeable future. One last bit of information, the highest price home on this weeks Tahoe Broker tour is $659,000. Affordability to our region does still exist.